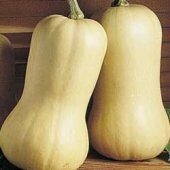 A variety that produces medium sized fruit, with that distinctive nutty butternut flavour. Winter squashes are characterised by the development of a hardened skin and the ability to be stored, typically up to six months. The wide range of winter squashes has become increasingly in demand in recent years, most notably butternut and kabocha types. ’Waltham’ is an improved version of the common Butternut squash. It has very little seed cavity, thicker & straighter necks, fruits earlier, and produces more flesh per fruit. It was bred by the Massachusetts Ag. Extension Service in the 1960’s by crossing ’New Hampshire Butternut’ with a wild African squash. The orange flesh stays firm when cooked, and it stores very well too.